10 A final word: Be strong in the Lord and in his mighty power. 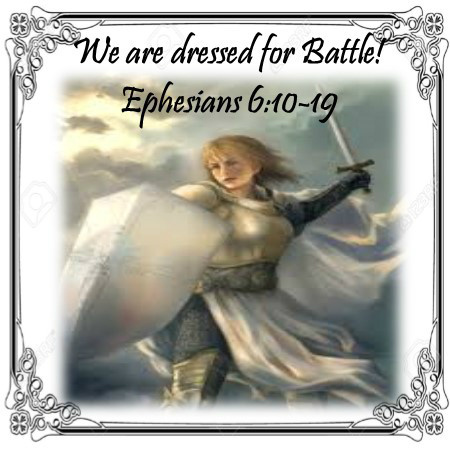 11 Put on all of God's armor so that you will be able to stand firm against all strategies of the devil. 12 For we are not fighting against flesh and blood enemies, but against evil rulers and authorities of the unseen world, against mighty powers in this dark world, and against evil spirits in the heavenly places. 13 Therefore, put on every piece of God's armor so you will be able to resist the enemy in the time of evil. Then after the battle you will still be standing firm. 14 Stand your ground, putting on the belt of truth and the body armor of God's righteousness. 15 For shoes, put on the peace that comes from the Good News so that you will be fully prepared. 16 In addition to all of these, hold up the shield of faith to stop the fiery arrows of the devil. 17 Put on salvation as your helmet, and take the sword of the Spirit, which is the word of God.18 Pray in the Spirit at all times and on every occasion. Stay alert and be persistent in your prayers for all believers everywhere. 19 And pray for me, too. Ask God to give me the right words so I can boldly explain God's mysterious plan that the Good News is for Jews and Gentiles alike. Ø So your heart is the seat of your life. And what the physical heart is to your physical life, the spiritual heart is to your spiritual life. Ø The purpose of all these layers was to guard the vital organs, particularly the heart. In case of a direct hit to the soldier’s upper body, wearing the breastplate could mean the difference between life and death. Ø Righteousness is right living – walking “in a manner worthy of the calling with which you have been called” Eph. 4:1. Ø Heart and Soul – Mind, will, emotions, conscience. Ø When Scripture speaks of your heart, it’s referring to the intersection of these four internal characteristics. Your Mind-distorting your thinking with lies about God through negative, unbiblical thought processes. Your Will-redirecting your ambitions away from eternal and godly pursuits. Your Emotions – tampering with your feelings, sadness or directing you to unstable choices. Your Conscience – influencing your conscience so it steers you to live in a way that doesn’t line up with biblical guidelines. Ø Wearing the belt of truth, putting on the shoes and helmet, using the shield or sword – they’ll do you no good if you leave your heart open to a full frontal attack by the devil. Ø Pray fervently. Seek God fully. Ø The enemy would like us to chase perfectionism instead of chasing God. If we aren’t careful, this pursuit can become a bottomless pit of idolatry. Ø How do we shake free from our legalistic do-gooding, while at the same time meeting God’s standard and donning the breastplate that keeps us protected from demonic assault? Ø Comparison is an often used method for determining one’s righteousness. Ø Comparison soothes but it also deceives, making us feel justified with sinful actions. Or it can be disheartening when we feel that others are doing better than us. In either case it’s inaccurate and deceiving, which is why the devil loves when we do it. He works to keep us looking at others instead of looking to God Himself. Ø The cross really is the gift that keeps giving. Because it didn’t just take something from us, it gave something miraculous to us. Ø Putting off the old and putting on the new READ EPHESIANS 4:22-24. Ø Read Ephesians 4… verses on the scripture study page for this lesson. Ø Sometimes lifestyle choices and habits are the same. You may have indulged lust for so long, for example, or lived tethered to pride or anger for so many years that it’s become a comfortable outfit for you. Ø Lifestyle choices are symbolic of your old life. Dated. Antiquated. Out of character. Putting it off daily won’t be easy, but by God’s Spirit, it can be done. Ø Practical righteousness involves both putting off and putting on. These actions ARE the breastplate of righteousness. Ø It’s not a once-in-a-lifetime action. It is a moment-by-moment, day-by-day, repeated choice and action. Again and Again and Again. Ø Put off. Put on. Practice Righteousness. Ø Corralling our flesh can be monstrously hard. It’s a struggle to address internal sins like lust and pride, or to purify our motivations and energize our attitudes with joy. Ø God’s renewing work within us is what makes our putting off and putting on possible. Practical righteousness is an essential, logical offshoot of imputed righteousness. Ø Changed behaviors, as well as the changed internal attitudes that produce changed behaviors, are each natural outcomes of healthy growth. Ø A baby that isn’t changing isn’t growing. And if these things aren’t happening, we assume that the child is unhealthy. Ø If you want to grow in righteousness and see your life organically transformed from inside and out, spiritual health must be your focus. Ø God is the One who softens and prepares the soil of our hearts, allowing the implanted Word to take effect. But we still must make the choice to receive it. We must allow the Word to influence everything in our lives. Ø Merely being a hearer of the Word is not good enough. Ø Meditating on the Word, internalizing its principles and then implementing them in your actions is what supports the work of God’s Spirit in renewing your soul. In growing you. In your own life, or in the life of someone you love, when have you seen wrong choices and behavior become a “welcome mat” for demonic activity to infiltrate? How have you recognized the enemy targeting your thinking/ambition/feelings/conscience? Do you tend to struggle with perfectionism? If so, how does it impact your life? How does it make you feel when you measure yourself as better or worse than others? In what ways have you felt exhausted or discouraged lately at the work involved in trying to change and fix yourself?